The Angelique Bouquet blooms with sweet sophistication and gorgeous grace to create a special moment for your recipient. Cream pastel roses are arranged to perfection against the royal purple hues of lisianthus and monte casino asters perfectly accented with lush greens. Presented in an attractive gift wrap, this bouquet is an exquisite way to extend your warmest wishes and affection. Euro Style Hand Tied Cut Bouquet - Angelique Hand Tied. 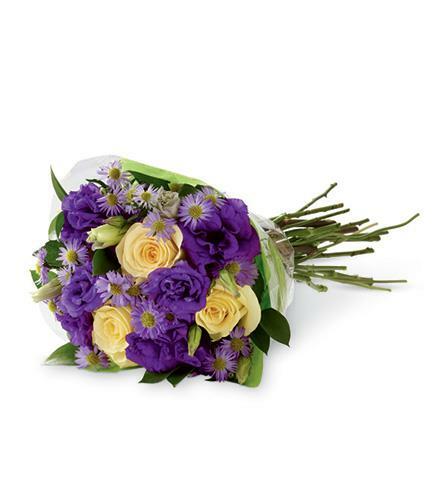 Florist Notes: The purple lisianthus flower is seasonal and is not usually available for same day delivery.